We’ve seen our fair share of dual-screen laptops in the past, but the 15-inch Asus ZenBook Pro UX580, unveiled at Computex 2018, is the most well-equipped and fully thought-out implementations we’ve ever seen. While it’s not a true all-screen device, this 15-inch laptop features a 4K screen up top and a 5.5-inch screenpad just below the keyboard. Essentially users can extend their display to the second screen/touchpad hybrid, allowing them to move any open window they’re working in or viewing and move it to the lower monitor. All the while users a can still move the cursor around, and scroll webpages just as if they were using traditional pointing device. This second screen acts more like touchpad for most of the time we used it, so we would just swipe along to move the cursor to areas we wanted to click and navigate applications. However, the second screen does include a drag-down interface you can tap on, and certain compatible applications like PowerPoint will also allow you to navigate through a simple series of taps. 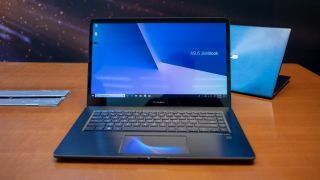 The Asus ZenBook Pro 15 UX580 is also packed to the gills with the latest components including up to an Intel Core i9 processor and Nvidia GTX 1050 Ti graphics. Users can also outfit their configuration with up to 16GB RAM and an 1TB PCIe 3.0 x4 SSD. The Asus ZenBook Pro 15 UX580 will be available mid-July 2018 for a starting price of $2,299 (about £1,730, AU$3,010).